Shannon Evans will consider stay- ing at UB. University at Buffalo star guard Shannon Evans said Monday he’s seeking to be released from his scholarship commitment to UB. Evans said early Monday he was determined to transfer from UB, but he stepped back from that position after an afternoon meeting with UB Athletics Director Danny White. 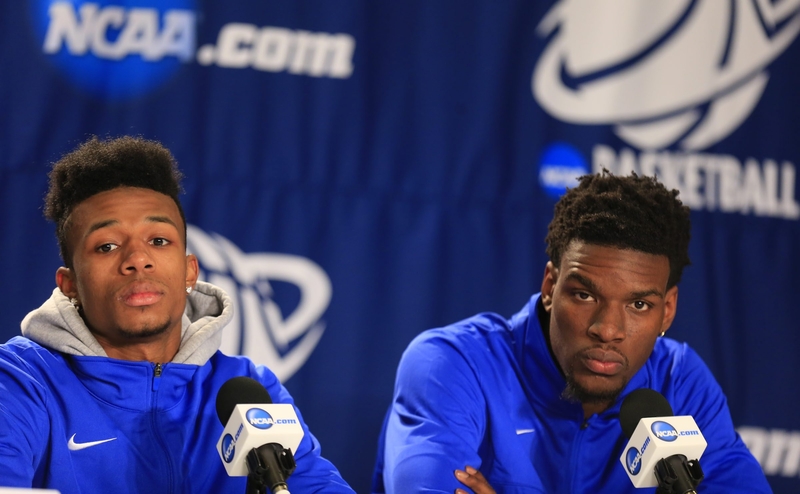 The sophomore guard said he still will consider staying at UB if the university releases him from his commitment and allows him latitude in contacting other schools about the possibility of a transfer. The 6-foot-3 Evans was a second-team All-Mid-American Conference pick this season. He averaged 15.4 points a game, seventh best in the conference. He also ranked third in assists at 4.6 a game, third in free-throw percentage, second in steals and third in minutes played. For now, Evans will wait to see what UB decides. Evans was very close with former UB coach Bobby Hurley, who left for Arizona State. Evans said the big reason he’s thinking about leaving is the possibility of playing at a higher level. Evans said he has wrestling with his decision for a couple weeks. Evans said the situation came to a head when he tried to talk to White early Monday but was put off. White is leaving Tuesday for an out-of-town business meeting. Evans said Oats, UB’s new coach, informed him that if he asked for his release, UB would block a move by Evans to go to Arizona State, Virginia Commonwealth, Old Dominion or another MAC school. Evans is a native of Suffolk, Va. Whether Evans could get an opportunity to rejoin Hurley remains to be seen. As of Monday, UB preferred to not allow it. VCU and Old Dominion are close to Evans’ home. UB is due to play Old Dominion in a non-conference game next season, and it’s believed the Bulls may have a game set with VCU in the future. Whether that should be a factor for UB is debatable. Evans said he likes Oats, who served as Hurley’s right-hand man the last two seasons. Evans’ joyful style on the court made him a crowd favorite this season. Evans was UB’s second-best player this season, behind MAC player of the year Justin Moss. Evans’ departure would be a big loss, although UB has a lot of talent even without him. The impact of his loss would depend on how the roster stacks up after the spring recruiting season. The University at Buffalo women’s basketball team landed a big - as in very tall - prospect from the Netherlands, the university announced. Mirte Scheper, a 6-foot-5 center from Amstelveen, the Netherlands, signed a National Letter of Intent to join Coach Felisha Legette-Jack’s team. Scheper has played on both the U16 and U18 Netherlands national teams and currently participates in the national development program, CTO Amsterdam, of the Netherlands Basketball Federation. It’s supported by the country’s Olympic Committee. Scheper visited UB over the weekend. She will graduate from secondary school in June. She becomes the fifth international player on the UB roster, joining four Australians.